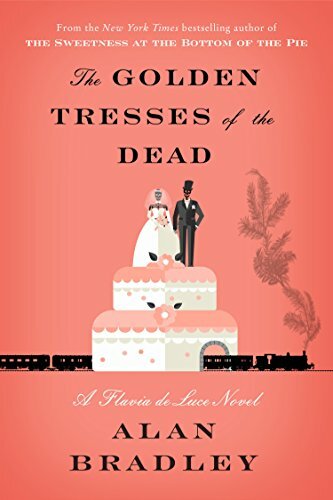 Flavia de Luce is insatiably curious about science, especially chemistry, and in her exquisitely uncomfortable British home where half her family’s dead and the other half make fun of her, no wonder she turns to detection instead. In this tenth in Allan Bradley’s irresistible series, Flavia faces a new loss: Her sister Feely (for Ophelia), who maybe sometimes likes her, gets married in a gorgeous ceremony and is about to depart on a honeymoon trip. Just as Flavia begins to realize what a loss this will be, distraction erupts with Feely’s horrified discovery of a severed human finger in the wedding cake. “Someone had put the ordeal beans of Calabar into Mrs. Prill’s coffee maker. “I couldn’t wait to tell Dogger. “It was too late tonight. He needed his rest. And so, to think of it, did I. “I switched off the lights and went back to my bedroom. I sat on the edge of my bed reviewing the events of a hectic day.